The title of this post may sound silly at first, but it’s actually a really great (and unintentional) way to define a credit card balance transfer. Trust me, I’m always trying to come up with a way to define it in the simplest terms possible. You see, when you choose to execute a balance transfer, you’re essentially using one credit card to pay off another. 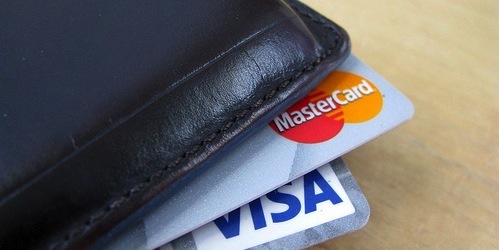 What makes it unique (and actually doable) is that the credit card issuer who agrees to pay off your existing credit card balance is making a bank payment on your behalf. In other words, you wouldn’t be able to make a “normal” credit card payment with one of your other credit cards. Only a bank can. Confused yet? I am. But seriously, unless it’s a balance transfer, you CANNOT pay your credit cards with another credit card. You must make a payment from a bank account of some kind – otherwise credit card issuers would go out of business overnight. Don’t fret. You can still “use a credit card” to pay off the balance, but it must be via a balance transfer request. Why? Because when a bank agrees to your balance transfer request, they pay off your balance via a bank payment. Then they assume your debt, and you start making payments to them. So as you can see, in Step 5, the balance transfer credit card issuer acts as a bank and makes a payment for you, for whatever amount you decided on when you made the balance transfer request. That amount (plus any balance transfer fees) becomes your new balance, and must be paid off as well. The advantage is that the transferred balance should have lower APR, or most likely 0% APR for some promotional period. This will allow you to manage the debt and pay it down at your own pace without worrying about new interest accruing. All said, you can technically use a credit card to pay off your other credit card(s). For the record, this can be accomplished with balance transfer checks as well.